Hopelessly Devoted Bibliophile: Birthdays and Anniversaries, Oh my! Greetings my bookish friends! It has been a bit since I've done a personal update and today happens to be my birthday so instead of working on the several reviews I need to do, I decided a fun post was in order. I actually made that cake in the picture for my little ones 3rd birthday a few weeks ago. Yes, she's 3 now. CRAZY right? 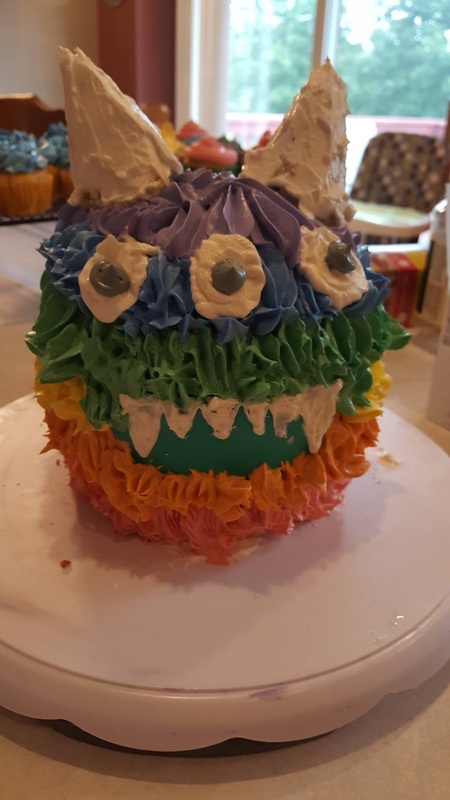 When we asked Peanut what kind of party she wanted she said "a rainbow monster cake to scare my friends cause that would be funny". I enjoy baking as a hobby so I figured this would be a fun challenge. It was an interesting experience and was delicious so all in all a success. Peanut was thrilled with the results. Despite my lack of reading and blogging, I have kept up with reading to my kiddos on an almost daily basis. They are growing up with a love of books and reading, and really that's worth a few years of less than stellar book counts under my name. I do miss getting lost in a book and reading a story from start to finish in one sitting. I took a mini vacation recently and got through 3 books in 3 days. I forgot what that felt like. The demands of two young kids have made it difficult to focus on books, but I've been told that it will get easier as they get older. I'm just happy to be getting a decent amount of sleep again, real talk. Anyway, thanks for your continuing patience with my (our) inconsistent blogging schedules. I think Jessica would agree that our interest in providing great content has not waned, but life gets in the way sometimes. We appreciate you!